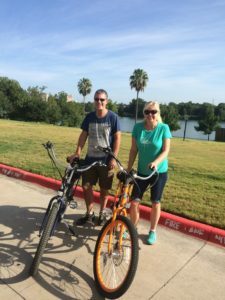 Marna and her husband Jody were amazed at how little they’d tired or sweated during their first electric bike tour last summer during a 101-degree day in Austin, TX. “I had not been able to ride a bike without pain and muscle fatigue for years, but with the ebike, I really experienced the joy of riding. I felt like a kid again!” Marna recalled. In fact, such a great experience would prompt them to order their own ebikes upon returning to Richmond. Still on their high, Marna and Jody decided to take their traditional bikes on the newly opened Virginia Capital Trail since their ebikes had not yet arrived. Marna, thinking she was in decent physical shape, still had to stop after a half hour of biking east and take another half hour to catch her breath. Sitting by the Trail, she watched the many different types of cyclists going by – bike enthusiasts whizzed by, families with small children slowly cycled by and then the “others,” which consisted of 35-65 year old adults all struggling and panting by. You could see it all over their faces – they wanted to enjoy their bike ride but the traditional bikes proved harder to ride. Their ebikes arrived a few weeks later, and Marna and Jody hit the Trail again. The fun of riding was back. 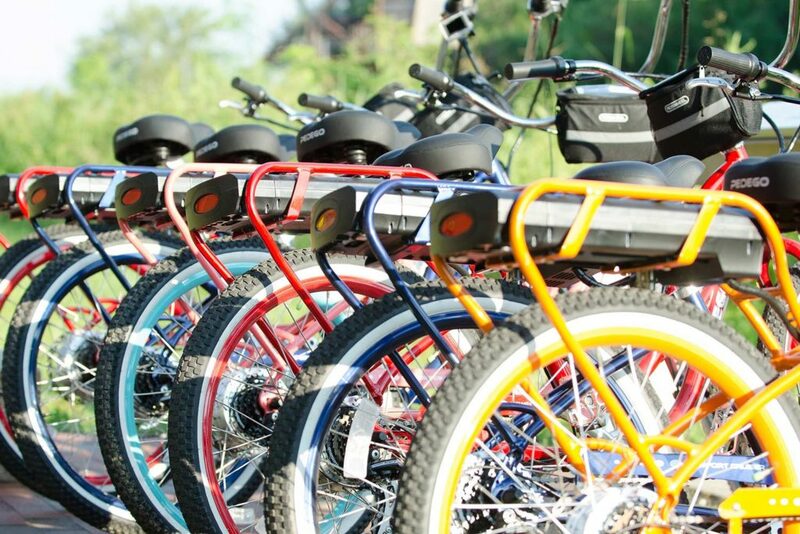 With ebikes, you don’t have to be in great physical shape to ride. It’s a fun way to get some fresh air and exercise without having to work too hard. As a travel agent for many years, Marna knew a thing or two about the travel industry and started thinking about all the city tours she had taken over the years. She thought of what makes Richmond such a great city – so full of history and wonderful things to see including the Virginia Capital Trail. What better way to experience Richmond than by bike? Electric bike that is! Marna pitched the idea of creating an electric bike tour company in Richmond to two other partners. Her enthusiasm about the fun she had and how she wanted to share this riding experience with Richmond sold the partners – her brother, Bill, and Cheryl, her best friend since high school. Through a family-and-friends survey, they came up with the name pulling from Marna and Bill’s Swedish decent. Kul meaning “fun” in Swedish, Kul Wheels was born. Marna pitched the idea of creating an electric bike tour company in Richmond to two other partners. Her enthusiasm about the fun she had and how she wanted to share this riding experience with Richmond sold the partners – her brother, Bill, and Cheryl, her best friend since high school. Through a family-and-friends survey, they came up with the name pulling from Marna and Bill’s Swedish descent. Kul meaning “fun” in Swedish, Kul Wheels was born.